OPI educator and guest artist Lynn Ackerson-Warren gives some quick tips on acrylic backfills. Creating and maintaining a permanent French manicure for your clients doesn’t need to be intimidating. This step-by-step guide to mastering the pink-and-white backfill includes a list of common pitfalls to recognize and avoid. By acquiring this advanced skill, nail technicians can earn more money per service and stay one step ahead of the game. Erica’s ATA’s Cuticle Sciver bit can be used to exfoliate the dead skin around the cuticle and nail plate. Whether you’re a veteran e-file user or you’re thinking about taking the plunge for the first time, you’ll want to hear this powerful argument in their favor, as well as some valuable tips on how to shop for and maintain your unit. 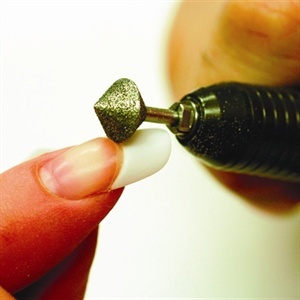 Getting the right mix of acrylic liquid and powder is crucial to creating long-lasting nails. Here are NAILS’ FingerNailFixer blogger and CND educator Holly Schippers top tips for achieving the perfect mix ratio. Nail tech Lynda Lam has an easy method to clean out stubborn gel or acrylic from e-file bits: She uses a pink eraser like the kind you use at school.